Today was miserable; it poured with rain all day. We distributed rain ponchos, power banks, hoodies and t-shirts (brand new ones thanks to a very generous donor) but it was teaming down. We took the tea urn and warm drinks were gratefully received along side wonderful homemade flapjacks. 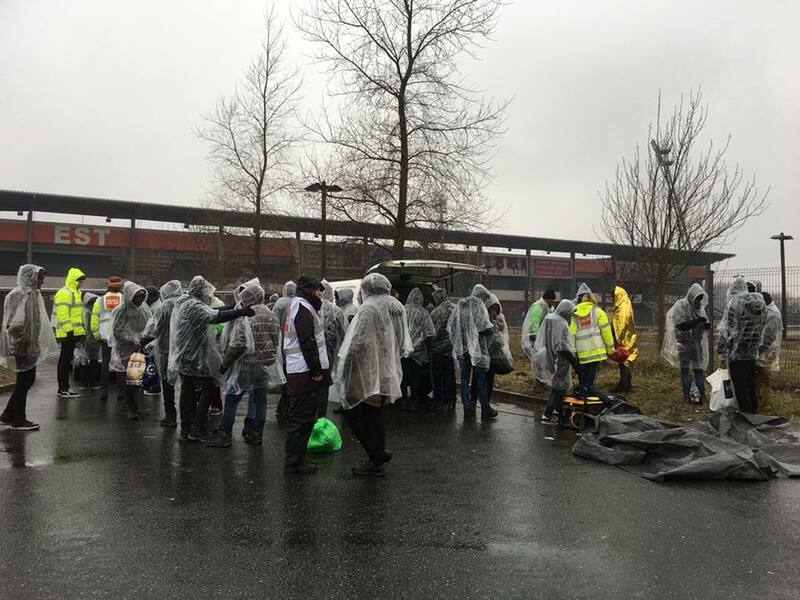 My job was to hand out the rain ponchos as the refugees, who had been seeking some shelter under the motorway bridge, approached the van in small groups. I handed out the ponchos to anyone who wasn’t wearing one, occasionally helping a refugee with freezing cold hands to drag one over his head. We had been there for over an hour when a refugee, walking at speed, appeared. I spotted him from about 100 meters away and walked towards him ripping open the rain poncho packet, ready to try and keep him dry. As I approached, I noticed two things; his eyes were streaming and he was young. I later found out that Khaild was just 17. He had just been peppered sprayed straight into his face and was desperate to get to the medics who had accompanied us. The medics were with him for a good half an hour, trying to easy his pain, washing his eyes and face to try and remove the pepper spray. I had to walk away as the sight of this young man in agony was extremely distressing. I don’t cry easily but I did this afternoon. Whilst he was being treated, we put a hoodie and t-shirt to one side so he could at least change some of his contaminated clothes. Fortunately, the medics managed to finally remove the pepper from his eyes and face. Khaild had a cup of sweet black tea then it was time to leave. Why was he sprayed? Because he was stood at the side of a road! I am so grateful we were there today and the medics had come with us. I dread to think of the consequences had we not been there. Ordinarily it takes 10 minutes to remove pepper, it took over 30 to get it out of Khaild’s eyes as he has eye damage that the pepper had stuck to. He hugged me as he was leaving and my heart broke watching him walk back to the motorway bridge to settle down for the night.